Lea was bright and chipper when I arrived back at Riverview Hospital this morning, and she was looking forward to breakfast. I had gone home a little after midnight last night, since she had done so well the nurse was able to remove all of her telemetry. No oxygen monitor, no blood pressure monitor, and no pulse monitor. She was rebounding from surgery better than anticipated, and was tolerating pain quite well. So, I opted to go home where I could lay down on my own bed, rather than sitting up in a recliner all night. I have had a lot of practice sleeping in a hospital recliner, and was prepared to stay with her overnight so she wouldn’t have to worry about staying awake to administer her own pain medication or remember to breathe deeply enough to keep her oxygen levels up. She rebounded so well, however, monitoring those things became unnecessary, so it was a good chance for me to get a few hours of horizontal time, knowing how important that rest was going to be over the next several days of recovery and rehabilitation at home. We had a couple of bumps in getting our medical maintenance started yesterday, as the nursing staff had not received any pre-admission information on her diabetes treatment. I don’t know why the information didn’t get in the records, since we went over her treatment with the perisurgery nurse prior to admission. It was dinner time before I realized that they were not monitoring her sugar and administering her insulin as we have been doing. And then it took them a while to get the treatment course verified and ordered by Dr Miller, who had already left the office for the day. 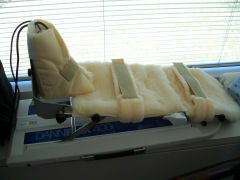 We had also expected that she would have an ice machine circulating cold water over her knee implant when she came out of surgery, but the machine was sitting on the floor by the bed until well after dinner, when Lea complained that her knee was starting to hurt with a dull throb, and asked when the ice machine was going to be started. The reply was a somewhat startled, “Oh, it hasn’t been started yet?” It was started immediately, and seemed to reduce her pain significantly. We have been hospitalized in Intensive Care Units so frequently I think we expect a higher level of attention than is normal. We were a little concerned after being settled in the new room that there wasn’t a rush of nurses and nursing assistants buzzing around getting things hooked up and her treatment course started. In fairness, however, she was in a regular hospital room, not Intensive Care or even a step down unit. She had been whisked by two surgical nurses directly from the Surgery Recovery room to her regular room with her meds and pumps already hooked up. So, her nurse in the new area may have expected the ice pump to be already in operation as well. 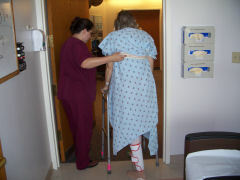 We also understood that she would have a machine, called a CPM, that flexes the new knee, very slowly, a few times each minute. We had gotten the impression that her leg would be placed into the machine for at least four hours the first day, but there was no CPM to be found. It wasn’t until the next morning that the nurse was able to contact Dr Cittadine’s office and confirm that the CPM had been ordered. Surprisingly, (not!) it showed up within an hour of the phone call. At about nine o’clock this morning two physical therapists came into the room and got Lea out of bed for the first time to take a few steps on her new knee. She first sat up on the side of the bed, and after pausing a few seconds to get over a little lightheadedness, timidly stood up on her walker and took a few determined, though cautious, steps to the door. She experienced waves of nausea, but, with a little coaching, was able to focus her breathing to keep from getting sick. Her intensity of her pain was higher today, and she wasn’t very comfortable after the first hour in the bedside chair, even though the nurse had earlier increased her dosage of painkiller. She called the nursing station when the pain became pretty constant and asked to be put back to bed. Another hour later she had not been moved back to bed, and I wasn’t any longer able to sufficiently prop her ankle or calf sufficiently to get relief. About that time the Occupational Therapist came in to begin her evaluation of Lea’s therapy needs. Lea tried to respond to her, but kept weeping at the spikes of pain she was experiencing, her hands trembling from the intensity. After several minutes of trying to carry on a conversation, the therapist went looking for the physical therapists to get Lea moved, but they were not able to assist her at the moment. She decided to move Lea herself, and with a little help from me, got her back into bed. As soon as her head hit the pillow, and her knee straightened out, the pain began to diminish, and she was able to relax a little. I will order her lunch in a few minutes, but want to let her sleep a little while to get over the pain. I have mixed emotions about physical therapy putting her on the CPM this afternoon, but know that it is a necessary next step. Until then, we’ll try to help her get as much rest as possible. Glory to God for this day of opportunities to be in His service. 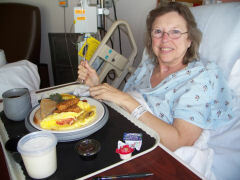 Here are some photos of her enjoying her breakfast, taking her first steps with her new knee, and a shot of the CPM device.